Newly released internal CIA documents assert that former president George Herbert Walker Bush’s oil company emerged from a 1950’s collaboration with a covert CIA officer. But the freshly uncovered memos contend that Bush maintained a close personal and business relationship for decades with a CIA staff employee who, according to those CIA documents, was instrumental in the establishment of Bush’s oil venture, Zapata, in the early 1950s, and who would later accompany Bush to Vietnam as a “cleared and witting commercial asset” of the agency. According to a CIA internal memo dated November 29, 1975, Bush’s original oil company, Zapata Petroleum, began in 1953 through joint efforts with Thomas J. Devine, a CIA staffer who had resigned his agency position that same year to go into private business. The ’75 memo describes Devine as an “oil wild-catting associate of Mr. Bush.” The memo is attached to an earlier memo written in 1968, which lays out how Devine resumed work for the secret agency under commercial cover beginning in 1963. “Their joint activities culminated in the establishment of Zapata Oil,” the memo reads. In fact, early Zapata corporate filings do not seem to reflect Devine’s role in the company, suggesting that it may have been covert. Yet other documents do show Thomas Devine on the board of an affiliated Bush company, Zapata Offshore, in January, 1965, more than a year after he had resumed work for the spy agency. While the elder Bush was in Vietnam with Devine, George W. Bush was making contact with representatives of the Texas Air National Guard, using his father’s connections to join up with an elite, Houston-based Guard unit – thus avoiding overseas combat service in a war that the Bushes strongly supported. The new revelation about George H.W. Bush’s CIA friend and fellow Zapata Offshore board member will surely fuel further speculation that Bush himself had his own associations with the agency. Indeed, Zapata’s annual reports portray a bewildering range of global activities, in the Mideast, Asia and the Caribbean (including off Cuba) that seem outsized for the company’s modest bottom line. In his autobiography, Bush declares that “I’d come to the CIA with some general knowledge of how it operated’ and that his ‘overseas contacts as a businessman’ justified President Nixon’s appointing him as UN ambassador, a decision that at the time was highly controversial. When McBride approached the CIA at that time, it initially invoked a policy of neither admitting nor denying anyone’s involvement with the agency. But it soon took the unusual step of asserting that the correct individual was a George William Bush, a one-time Virginia staffer whom the agency claimed it could no longer locate. But that George Bush, discovered in his office in the Social Security Administration by McBride, noted that he was a low-ranked coast and landing-beach analyst and that he most certainly never received such an FBI briefing. It was perhaps to help lay to rest the larger matter of the elder Bush’s past associations that the former president went out of his way during his recent eulogy for President Ford to sing the praises of the Warren Commission Report as the final authority on those days. After a deluded gunman assassinated President Kennedy, our nation turned to Gerald Ford and a select handful of others to make sense of that madness. And a conspiracy theorist can say what they will, but the Warren Commission report will always have the final definitive say on this tragic matter. Why? Because Gerry Ford put his name on it and Gerry Ford’s word was always good. This modification played a seminal role in ending talk of a larger conspiracy to kill the president. Knowledge of Ford’s alteration has encouraged theorists to scrutinize the constellation of other figures who might have had a motivation to cover up the affair. Meanwhile, there is much more to learn about George H. W. Bush’s friend, Thomas Devine. The newly surfaced memos explain that Devine, from 1963 on, had authority from the agency to operate under commercial cover as part of an agency project code-named WUBRINY. Devine at that time was employed with the Wall Street boutique Train, Cabot and Associates, described in the memos as an “investment banking firm which houses and manages the [CIA] proprietary corporation WUSALINE.” These nautical names – ‘Saline’ and ‘Briny’ – or, for the Bay of Pigs invasion ‘Wave’ – are CIA cryptonyms for the programs and companies involved. George H.W. 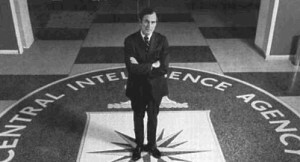 Bush’s own ties are amplified in the 1975 CIA memo, dated November 29, which makes it clear that he had knowledge of CIA operations prior to being named the new director of the CIA in the fall of that year. The Bush documents, part of a batch of 300,000 records the CIA provided to the House Select Committee on Assassinations, were publicly released in 1998 as the result of a lawsuit, donated to a foundation, scanned into a database – and only just noticed by an independent researcher. There are 34 comments Our Comment Policy: Keep it civilized, keep it relevant, keep it clear, keep it short. Please do not post links or promotional material. We reserve the right to edit and to delete comments where necessary.